History/Mythology: Petrified wood objects have been found from the Etruscan Temple that date back as early as 4300 years ago. 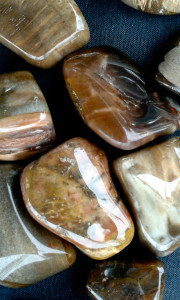 Petrified wood has been considered a very strong stone for magic in the past as it was thought that it was the fossilized bones or tools of the Gods. Healing – Used for hearing loss, paralysis and to strengthen skeletal structures. It supports you though times of crisis created by dis-ease. Can be used in all meditations – a stone circle or a slice large enough to sit on is the ideal way to use it. Used as a hand warmer or comforter when needed. All postage outside Australia $18.50 flat rate.